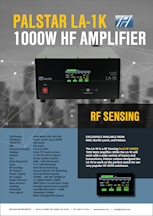 Introducting the new LA-1K RF Sensing Dual HF LDMOS 1000 Watt Amplifier. 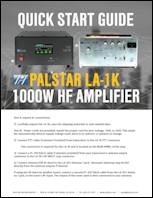 While the LA-1K will work with a wide variety of tuners and transceivers, Palstar custom-designed the LA-1K to work as the perfect match for our very popular HF-AUTO autotuner. Now shipping from all Palstar dealers. 5. Downloading the LA-1K firmware is only available on the desktop computer version of this site as updating the firmware requires connecting a USB A to B Cable (not included) between your computer and the LA-1K. V1.01C: Reduced transmit sequencing delay from 14ms to 3 ms.
V1.02A: Unkeys amplifier with low +50V (<44V) to protect transistors from damage if supply trips as on 120V > 32A conditions. V1.02B: Replaced the word "FAULT" with "BYPASS" for SWR Trip, Thermal Trip, and LW 50V Trip. Also, color changed from Red to Green on above (except temp#) when too hot. V1.02C: Firmware version not released. V1.02D: Firmware version not released. V1.02E: 1) Implements reverse RF protection against nearby transmitters that may "fool" the LA1K's SWR detector preventing the LA1K from keying when strong signals from close by transmitters are present, such as Field Day operating environments. 2) Implements basic overdrive protection that places the LA1K in bypass when RF input drive level exceeds around 68 Watts. (This is only sampled briefly before the LA-1K keys up, therefore slow rise time signals may not activate this protection).